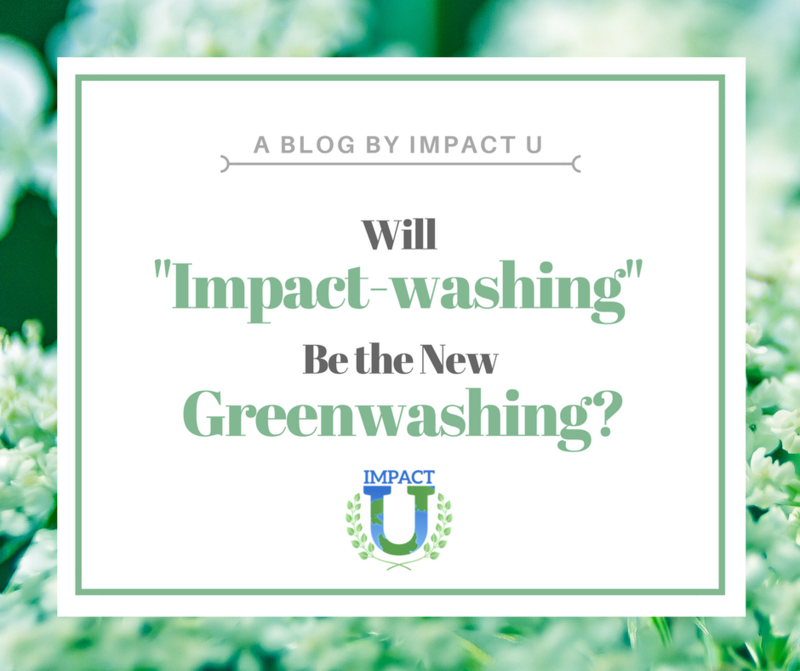 Will "Impact-Washing" Be the New Greenwashing? As we all know, the financial crisis was fueled by corruption, incompetence, and a lack of transparency. As the impact investing movement gains momentum, impact investors and advisors must keep a conscious mindset towards the formation of impact investments so that history doesn't repeat itself. You may have heard the term, “greenwashing”, which refers to a company portraying themselves as ESG conscious without having any real ESG benefits. It’s no secret that ESG concerns are becoming increasingly important to people, especially millennials. In order for companies to be attractive to millennials and socially conscious folks, they need to paint a picture of corporate social responsibility, and unfortunately, many paint a false portrait. In these cases the intention is to profit from a new market; to be truly impactful, the intent must be to have a positive ESG impact. This niche of investing is gaining much attention and demand. As impact advisors and investors, it’s our responsibility to demand the highest quality of ratings and regulations on impact investments to ensure that we are in fact making real and positive changes with our money, not just funding a greenwashing, or “Impact-Washing” campaign. One lesson learned post-financial crisis was to stay skeptical and perform careful due diligence. A potential issue we could face going forward is the accuracy of ESG controversy and sustainability scores of a company. So impact investors (both amateur and veteran) need to actively demand transparency and reformation on how impact investments are formed, securitized, and sold by retail and institutional investors. Impact leaders, experts, and enthusiasts need to demand peer-to-peer reviews on calculation and rating standards. If your investment objective is to create a positive impact wouldn’t you want to make sure that when you get a quarterly report of your returns - economic, environmental, social, governance, etc. - you receive the most accurate data to see the impact you have made with your investment decision? As impact investors, we demand significant change, but we must also fight for justified rating standards as well as proper impact reports at the end of each quarter. Stronger regulation and governance of the impact reporting system will be a key factor to avoid history repeating itself. Since there is so much ambiguity in the impact investing world, Vanderbilt Financial Group decided to launch Impact U, to help connect the dots and dispel confusion. ImpactU.me is a collaborative community that houses educational content from Impact Experts and Enthusiasts to clarify and educate individuals in navigating all the noise and confusion that comes with a rapidly growing asset class. Soon we will be launching our Impact U crowdfunding portal, ImpactU.fund to enable the masses to vote with their dollar to positively impact the world. The portal will feature Impact Organizations and Entrepreneurial Projects that will have an ESG impact alongside returns. In order to ensure that impact investors and advisors don’t get duped by greenwashing or “Impact-Washing”, we need your help. Have a favorite rating system? Think you’re a candidate for ImpactU.fund? Want to be featured on ImpactU.info? We want to hear from you! About Impact U: Impact U is an online collaborative community produced by Vanderbilt Financial Group. Impact U is dedicated spreading awareness through online educational content and crowdfunding impactful organizations with the goal of furthering the Impact movement because we believe that impact together is bigger and better. To learn more about Impact U, go to www.impactu.me.